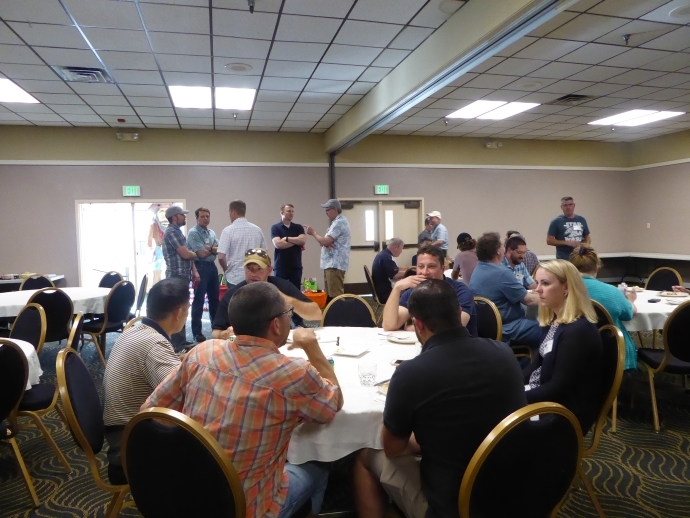 Over 40 ITS engineers and practitioners from the western United States met in June to discuss rural ITS implementations. 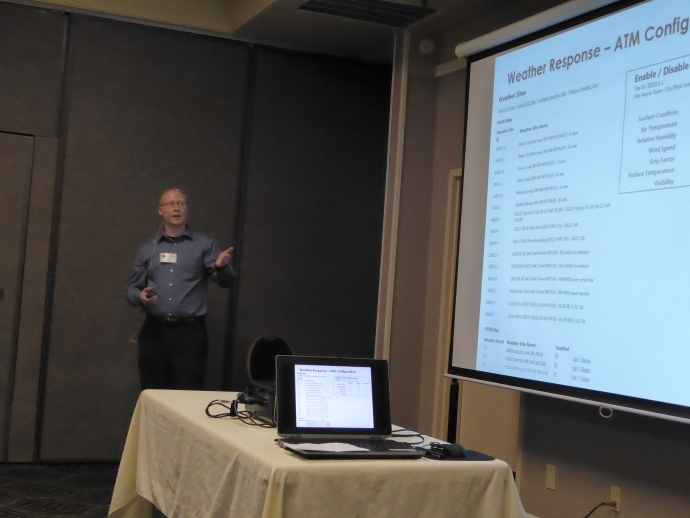 The 13th Annual Western States Rural Transportation Technology Implementers Forum included nine technical presentations and demonstrations with weather / road weather management as a common theme. Speakers came from six different states with several new faces. 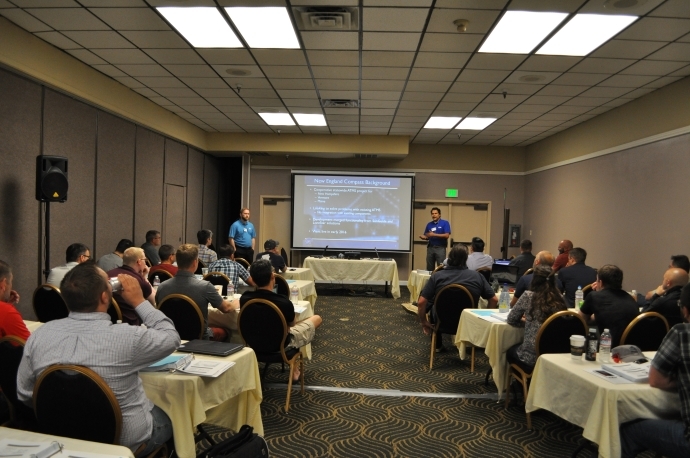 Participants came from diverse backgrounds as well: eight states (CA, ID, MT, NV, OR, TX, UT, WA) and Washington D.C., five state DOTs, the California Department of Water Resources, the Idaho National Laboratory, the Southwest Research Institute, IBM, three universities, and half of the Caltrans Districts as well as Caltrans Headquarters and DRISI. 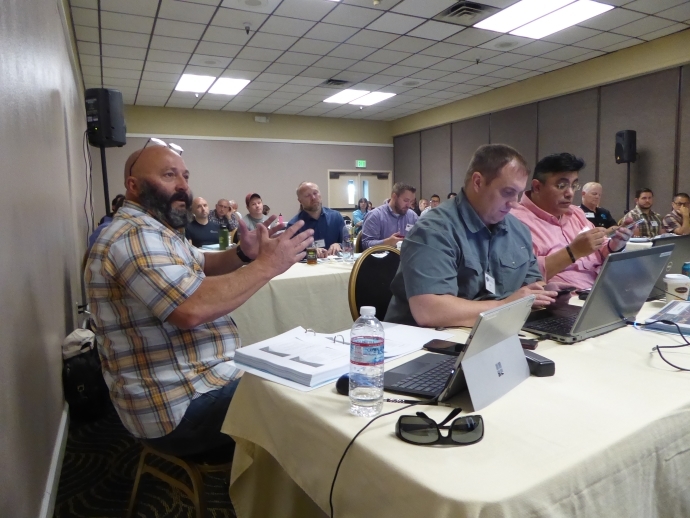 You can review the technical content and images from this year’s Forum on the 2018 Forum Page on the Forum’s website. 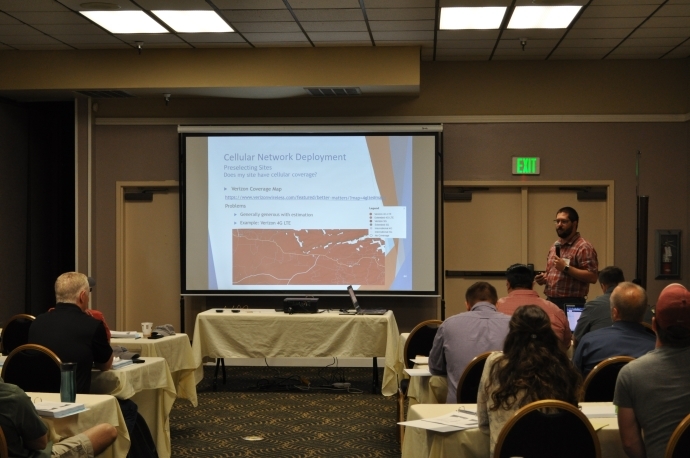 Keith Koeppen from Caltrans District 2 started the technical program discussing their cellular field sites that have been implemented to test system reliability and deployment strategies. He described system needs/requirements, practical tools, and configurations, among other technical details. 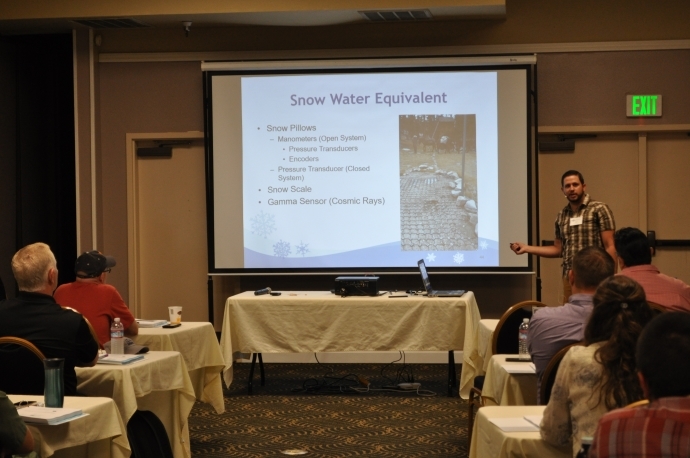 With a little different perspective on using weather data, Bryan Prestel from the California Department of Water Resources discussed their Hydrology Data Acquisition System (HyDAS). 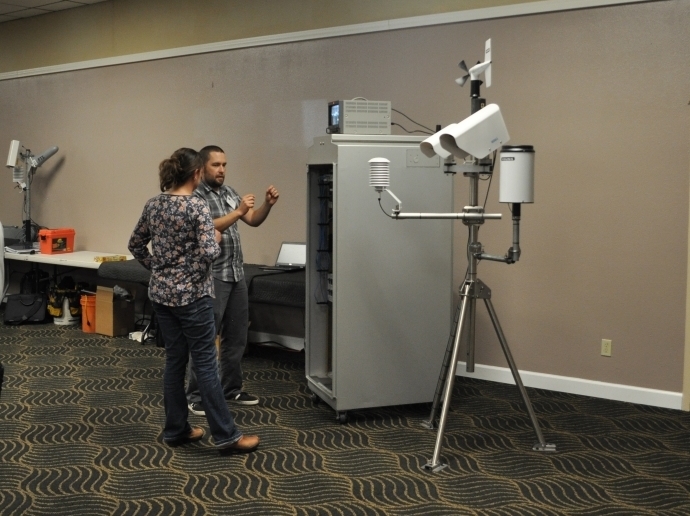 He reviewed data needs for his program and how the DWR systems are similar to roadside weather stations. Bryan shared details about the current and future infrastructure given the challenges with accessing the remote sites. It should be noted that Bryan and his colleague Nicholas Ellis attended the Forum last year after connecting with Ian Turnbull from District 2 about RWIS, weather data acquisition, and communications. 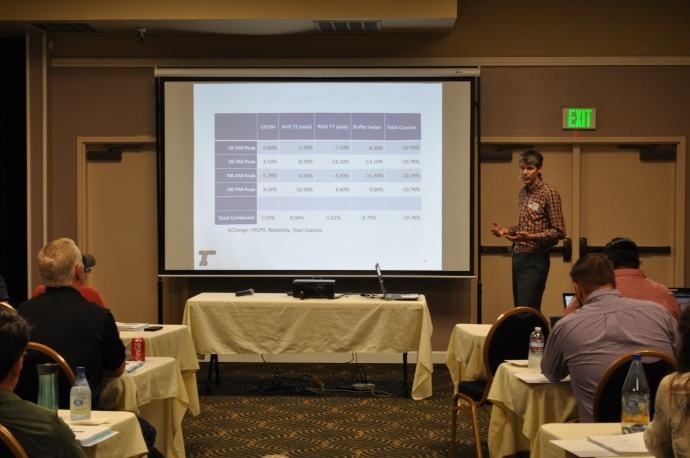 Oregon DOT again had two presentations on the technical agenda. First up was a review of ODOT’s Active Traffic Management system. ITS Design Engineer Blaine Van Dyke and ITS Systems Operator Michael Burkart gave an in-depth review of the applications that make up the statewide traffic management system. Six-time Forum speaker Doug Spencer from Oregon DOT presented their condition rating dashboard for ITS, signals, signage, and sign structures. Doug described ODOT’s need for the tool and showed the various features of the dashboard in detail. He explained how ODOT is using the tool to better manage asset maintenance, replacement, and funding. 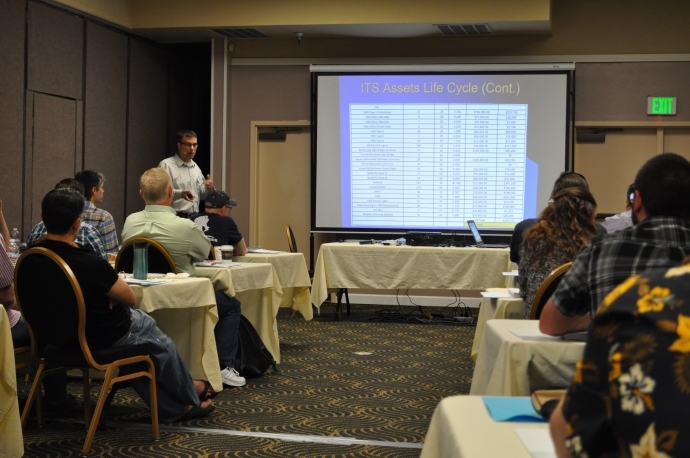 Here Doug S. is explaining ODOT’s ITS asset life cycle data and how the dashboard facilitates asset management. 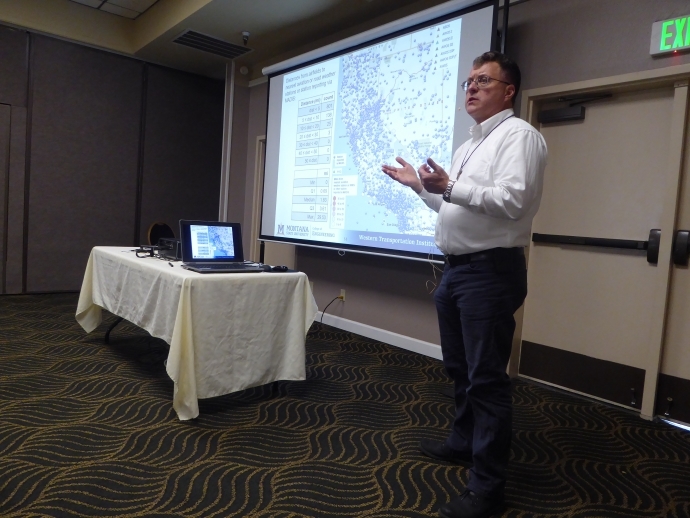 The Caltrans Aviation Weather Information (AWI) project was presented by WTI principal investigator and six-time Forum speaker Doug Galarus. Doug summarized the work conducted in the project since 2008 as a research and development study of a proof-of-concept system that is culminating in long-term implementation with Caltrans. In this photo, Doug G. is explaining the concept behind the project by showing how aggregating weather data from multiple sources can provide crucial weather information to rural, underserved airports and heliports. As a demonstration in Idaho, the Idaho National Laboratory (INL), the Idaho Transportation Department (ITD), and IBM developed an Advanced Traffic and Weather Visualization Platform to help INL address the transit challenges in and around site facilities. INL Fleet and Maintenance Manager Ira Pray (right) and IBM Senior Consultant Sarah Lightbody (left) teamed up to discuss the system, demonstrate the model’s utility, and describe future additions to the system. 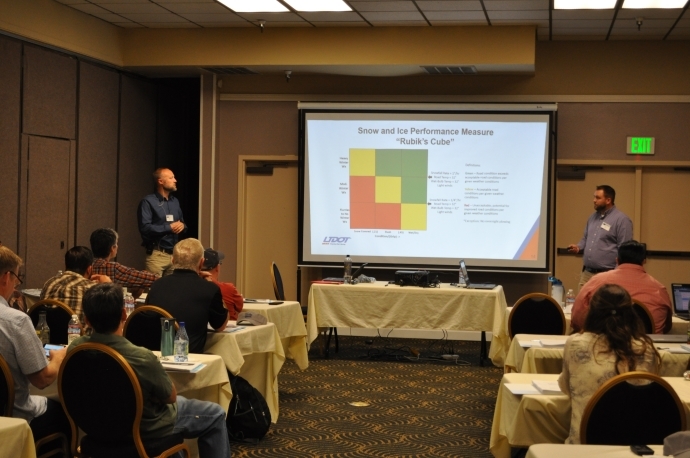 In another team presentation, meteorologists and Utah DOT Weather Operations group leaders Jeff Williams (RWIS Manager) and Cody Oppermann (RWIS Coordinator) described the Snow and Ice Performance Measure (S&I PM) they helped develop. With various real storm conditions, the team explained in detail how the S&I PM is utilized along with some of the hardware and software that make up UDOT’s road weather network. Here, Jeff (left) and Cody (right) are describing the S&I PM “Rubik’s Cube” that compares the road conditions given the weather conditions. 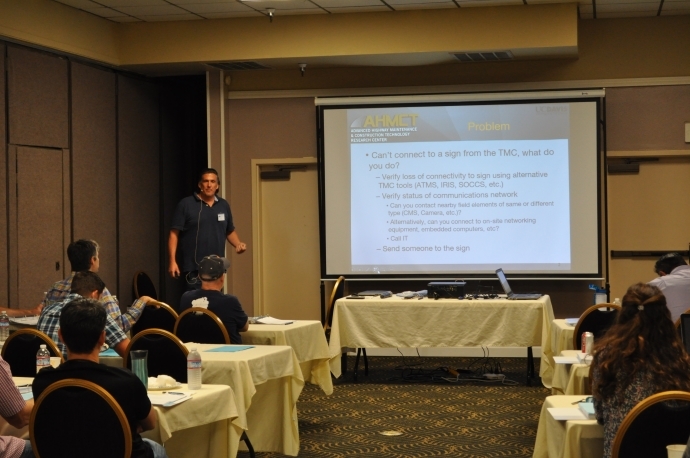 Stephen Donecker, a researcher with the AHMCT Research Center at the University of California – Davis, provided details on the mobile device app they are developing for maintenance of CMS field elements. In this photo, Stephen is explaining the need for a mobile device application to remotely access ITS field elements like changeable message signs. To round out the technical program, Ansley Skillern and Amit Misra from the Southwest Research Institute (SwRI) discussed their work to adapt urban ATMS systems for use in rural settings, specifically the New England states of Maine, New Hampshire, and Vermont. After reviewing the development of the system, the team demonstrated its features and functionality. The Forum continues to provide engineers, maintenance personnel, and technicians with highly technical information about rural ITS projects. It is unique in that questions and dialogue are encouraged throughout the presentation versus just at the end. 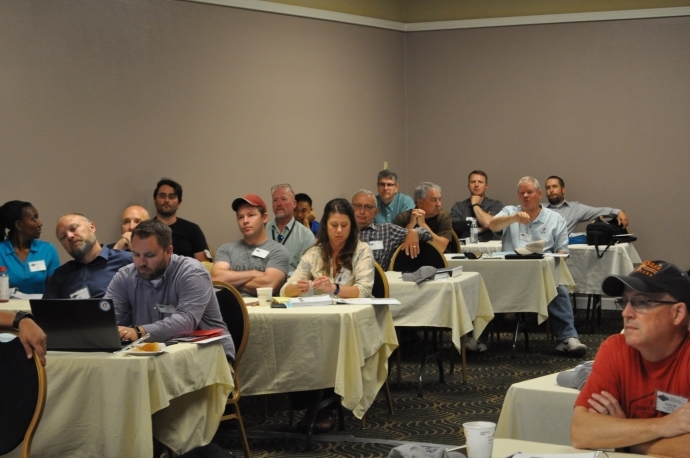 Once again, this year’s presentations and demonstrations provoked quality discussion throughout the Forum. Here, Jim Whalen (top) from Nevada DOT and Mike Jenkinson (bottom) discuss points made by speaker Keith Koeppen. Transparency and trust are important tenets of the Forum’s mission. To encourage this, over the years the Forum has maintained the rural perspective while continuing to create an informal atmosphere. 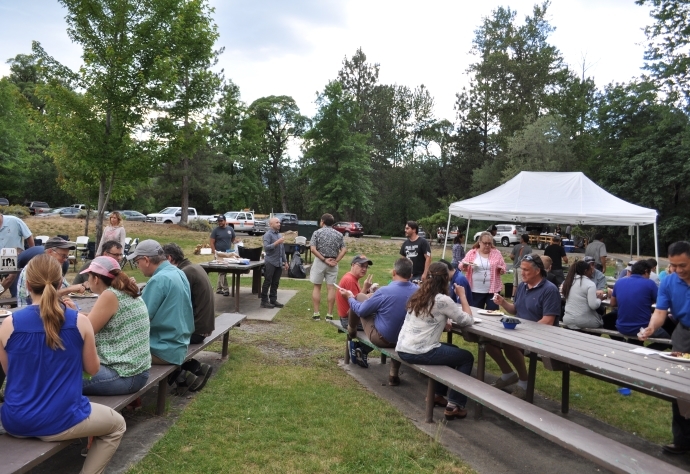 There are ample opportunities to network with peers during meals and extended breaks, and the Wednesday evening dinner and networking session were held at a local park. Here are a few pictures. Jeremiah Pearce from Caltrans District 2 is discussing their ITS node equipment cabinet and out-of-pavement RWIS sensors with Sheri Rodriguez from neighboring Caltrans District 1. Stephen Donecker from UC Davis shows Mike Beyer from Caltrans District 2 how the mobile app he helped develop can be used for CMS field element maintenance. Thank you to everyone who helped make the 13th annual Western States Forum a success! Save the Date for the 2019 Forum, June 18-20, and consider submitting an abstract.